They don’t sound dangerous, but falls are the leading cause of fatal and nonfatal injuries among older adults, according to the Centers for Disease Control. Every year, almost 1/3 of older Americans will fall and injure themselves. Outdoor falls are more common than indoor ones. These people weren’t out being reckless; almost 50% of outdoor falls were related to walking. They don’t have cushy landings. Seventy percent of people involved in outdoor falls land on a hard surface, such as concrete, marble, or wood. As loved ones get older, balance becomes a concern. Physical weakness, visual impairment, medications, or cognitive issues can cause challenges with balance. As they become less steady on their feet, they become more prone to falls on rugs, in bathtubs, and on wet surfaces. 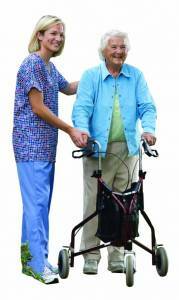 Taking a few preventative measures will go a long way towards preventing injuries from falls. Be sure someone nearby checks in on your senior relatives daily to avoid those horror stories you see on the news. Check medications to see if dizziness is one of the side effects; if so and it becomes a problem, discuss it with your parent’s doctor to see if an alternative is available. It might also be a complication of medications mixing. Schedule an eye exam to stay on top of vision problems and encourage light exercise. Yoga is excellent for balance; many groups offer programs specifically geared towards seniors. It doesn’t require special equipment or clothing and the stretching increases flexibility and helps improve balance. It’s also important to take preventative measures around the house to limit the chance of falls. The bathroom is one of the worst rooms in the home for falls; 70% of them occur there. This list of tips for each room will help you protect your loved one from falling as much as possible. Be sure there is a light within reach of the bed and there’s plenty of light between the bedroom and bathroom. Don’t keep rearranging furniture, so people with vision issues won’t fall over a table in a new place. Keep clutter out of pathways so they’re wide and clear. Anything in the way is a tripping hazard. Closet shelves should be between shoulder and waist high to avoid excess bending and stretching. Install grab bars and nonstick mats or decals in the bathtub. Shower chairs/transfer benches make getting in and out of tubs and showers easier. A wall-mounted dispenser releases the right amount of shampoo, conditioner, or shower gel at the touch of a button without fumbling with bottles. There’s less chance of bottles leaking and causing slipping. Toilet grab bars that attach to the toilet are preferable to wall attached bars for seniors with good arm strength. A toilet riser helps older people stand up easier. Night lights both inside and outside the bathroom ensure plenty of light to see when walking in the dark. If possible, replace the flooring with nonslip tiles, and remove all rugs. The door should open outward, in case of emergency. Increase lighting by using higher wattage bulbs or installing task lights. Replace towel bars with grab bars that can do double duty if your loved one slips and panics. Move lights and electronics so they’re along walls and not in pathways. Be sure cords can’t accidently get into traffic patterns; use Velcro or zip ties to attach them to furniture or lamp legs if necessary. Remove any low-profile furniture, like a coffee table or footstool. It’s too easy for someone who has vision problems to walk into it and stumble, and falling can result in anything from a bruise to a broken bone. Create wide, clear paths through the room. Narrow, windy paths through a room only make it more likely that a fall might happen. Older people occasionally wobble or stumble as they walk, and you don’t want them to hit a dresser top cluttered with fragile knickknacks. Use sofas and chairs with sturdy armrests that they can use to assist with getting up and down. A transfer pole can also help, if a favorite chair doesn’t quite have the support it should. Place a water absorbent, nonskid mat in front of the sink to quickly soak up any water that may splash out. Be sure the backing has no cracks or missing pieces, and replace it as soon as it does. Be sure the lighting is bright enough to see clearly. Add task lighting if necessary. Keep shelving between shoulder and waist height as much as possible to avoid excess stretching and bending. Choose kitchen chairs that have arms, to allow older family members to use them for assistance in getting up and down. Install good outdoor lighting on porches, stairways, and along walkways. Solar lights are inexpensive, use no wiring, and come in a wide variety of designs. Keep steps and walkways free from debris like leaves and limit holiday decorations. A huge display can leak or come apart and lead to a fall. Have sturdy handrails on stairs. A hand on a steady rail can help keep your loved one from serious injury. Hire someone nearby to shovel the sidewalk after a snowstorm and/or apply deicer. Encourage your loved one not to do this themselves, as ice is dangerous enough to someone with good balance. No matter what kind of help your senior needs to live independently, the skilled professionals at Assisting Hands Home Care can provide it. We offer in-home care that includes light housekeeping, companionship, errands and transportation, and a variety of other services. We’ll meet with you and your loved one to learn the needs of your unique situation and develop a plan that fits those needs. Once you approve, we’ll match your loved one with one of our highly skilled caregivers. We’ll do whatever is possible to help your loved one live on their own as long as possible.